The Arrival is a heavy book with a riveting story that tackles on sociopolitical issues with a touch of the metaphysics. It's thought-provoking with compelling characters that make good reading company. Palestine: 1948—With the winds of war fast approaching, an unscrupulous archaeologist finally finds the remains of the man he’s been searching for … unwittingly releasing an ancient evil on the world. White River, Arkansas: 1980—In a secret lab, top-level medical scientists work together to harness the power of previously unheard of DNA manipulation. 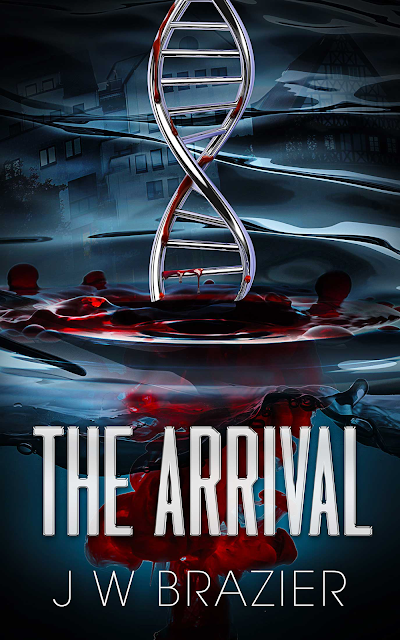 But when the project finally comes to fruition with the birth of a specially “designed” baby, it just as abruptly comes to a bloody halt, with the facilities and nearly every member of the team wiped out, silenced forever… almost. A darkness unleashed on an unsuspecting world. For the first few chapters, the narration felt so detached with the characters. It would have been better if the author has shown how Ian and Charles had gotten close to each other during their expedition in Palestine (1948) because I still see it unbelievable how they forged a bond of true friendship. By the end of their expedition, suddenly Ian just offered his number and home address to the doctor and the next thing you know in the next chapter, they're still in contact with each other after 3 decades. That does not sound legit to me because I'd always ask how despite working side by side for 18 months. Meanwhile, the narration felt warm ever since Joshua Austin, the next mayor of White River, was introduced. Everything went smooth from there. The book is written in the third-person perspective with a variation of characters good or bad. Primarily, Ian Taylor is the main voice for the early part of the book while Joshua Austin took over for the most part. Both are pretty badass. While Ian's an archaeologist (a sought-after one for that in his 30's), Austin an evangelical-Christian-turned-political-figure (he also was once a chief engineer on riverboats), they both have military background prior to their recent jobs, although Ian's was due to compulsory military service during WWII (he was born on 1910). Not only that, they're big guys! Ian stands at 6'4" while Joshua at 6'2". There are so many political ideologies which makes this book sound legit. This is a pre-dystopian story with an inside look of a highly-likely world-building plausibility. You know, with the government snooping on everybody, people's excessive dependence on technology, the government's trampling on citizens' constitutional rights in favor of anti-terrorist agenda, etc. Not only does this book address political correctness but it also addresses moral issues like abortion. One thing, Ms. Gray, is forgotten by this tragedy: the embryo is human, not a nonhuman as the Supreme Court declared. Abortion never was about the poor or about women’s rights. It’s an ideology with an agenda—and it’s a profitable business. So, Ms. Gray, I dare say few politicians will speak that truth for fear of political reprisals. I’m not afraid. Politicians and courts made legal what is a morally reprehensible act of brutality. I call it what it is: judicial tyranny. To those who are not affiliated with the Christian belief, this book might be a little too preachy. As a Roman Catholic, all things in regards to Christianity sound like the usual Sunday sermon (not that I always attend mass, I haven't for years) so they're normal to me but I could imagine they could be annoying to those who aren't Christians and most likely to those who have no religious affiliation. Oddly enough when I think that either the author is a devout Christian or he just did his research so well when it comes to the Christian belief, sometimes I think he's being sarcastic. For the most part, the book sounds so leaning towards Christian morality (with me quite agreeing) and yet near the end, there was something that made me feel suffocated with the idea of the church intervening way too much on the affairs of the state. I can't remember what it was but at that point, I couldn't help but groan in displeasure already. The story kind of drags. There are too many diatribes and long exchanges between characters, especially between enemies that sometimes I couldn't wait for some action. This book has the kind of story that appears not on the big screen but on a tv set with all the regurgitating-yet-on-point dialogues. Whatever message the author was trying to convey, there sure is a need for repetition since people have become amoral these days. More so, that the ones who usually start bloodshed and immoral acts are political leaders whose actions sometimes are hard to reverse (like the legalization of abortion) and especially if something's profitable. Moreover, you have to keep track of the events in the book (especially some characters' ages). There's a time period of 1948, 1980 and finally 2019. The enemy's the most unlikely group you'd think. For bad guys, they're quite decent. They follow rules and orders. I can't blame them when they're usually UN-affiliated military guys. It's not about them being so organized, I've been waiting for long until one group goes their own way in attacking the main characters blind. Basically, Satan is the enemy, preparing for his arrival in the world through his loyal servant, Abram Solomon, a shadowy figure among world elites and CEO of Solomon Industries. Abram is really scary. You can just imagine his disposition similar to that of an SS Nazi (Richard Sammel is perfect for the image). He was this huge figure that his exit has taken me aback. There was this revelation near the end that has been kept ever since the introduction and yet, I was not surprised. It's not because I guessed right but because I didn't find it something big. That part I say is anticlimactic. The book ended quite at a cliffhanger but whatever transpired before the dénouement wasn't a blast. I don't know if it's just me or there's just no emotion there. Other than those things, the book is good. I strongly recommend this book to those with strong political views and high moral compass.